We recently showed you a Steering Wheel and Pedals for RC. 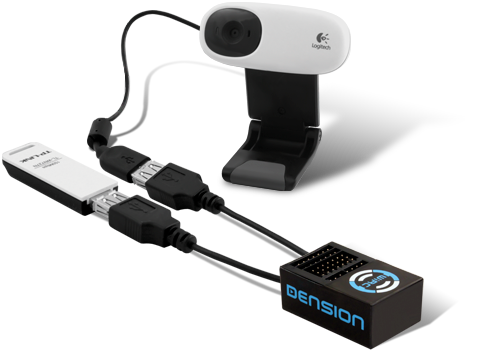 Well now we feature two cool products from Dension. The first one is the Dension WiRC it is a plug&play wireless RC receiver that allows you to control your RC vehicle with your iPhone/iPad/iPod Touch or Android device using WiFi. The App, is available for free in the App Store, it lets you drive with on-screen joysticks or by tilting the iPhone/iPad/iPod Touch or Android device. The best part is you can watch a real-time video stream coming from your vehicle. It comes with a WIRC Control Panel, a USB camera, a Wi-Fi dongle and a User/Installation Manual. Check out Dension for more details. 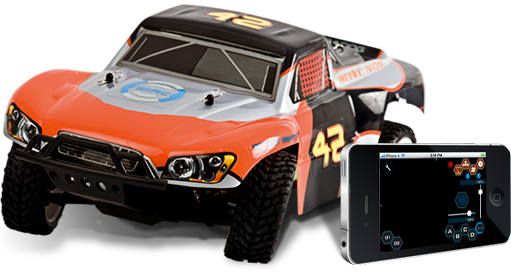 The second one is called the SmartRacer it is a 1/16 4wd SCT, that you control with iPhone/iPad/iPod Touch or Android device using WiFi. And same as above, you can watch real time video of the action. It already has the on-board camera. For more details, Check out SmartRacer.